UltraHash.pw is Another Crypto Mining SCAM! We have received a number of questions from our friends and readers regarding UltraHash.pw, the latest cloud mining platform and this article is our comprehensive answer to all questions, hopefully. We tried to include as many details as we could in this post and we are sure you will learn something from this, and hopefully safeguard your money. UltraHash.pw is a site that sells hash power and cryptocurrency mining services to people interested in acquiring cryptocurrency. The site allegedly operates a hardware mining farm which consists of very powerful computers and sophisticated software and which can mine large amounts of currency at a time. As a consequence, you need to be a little conversant with the technical processes involved in the mining of digital currency in order to make good returns. If you are not, we suggest looking for a site that sells ready currency which might be relatively more expensive. Currently, UltraHash.pw allows you to mine Bitcoin, Litecoin and Dogecoin at affordable rates and gives you the option of choosing your hash rate depending on how much you are willing to pay. You can also mine more than one currency if you so wish as long as you can afford the hash power. UltraHash.pw accepts investors from around the world including the US and China. Notably, most governments are still in denial over the power of Bitcoin and the other cryptocurrencies and thus have not put up structures to regulate the industry and protect their citizens from frauds and scams. Still on that note, we couldn’t track the country from which the site operates its servers or the exact location of the alleged mining farm – red flag. The .pw TLD is a country code, by the way, belonging to Republic of Palau, an island country located in the western Pacific Ocean. However, in the case of UltraHash, the .pw stand for Professional Web, a relatively new TLD, which adopted policies and practices to create an abuse-free namespace that is safe and secure. UltraHash.pw is advertised as a very cheap product, particularly because one does not necessarily need to deposit any money in order to start mining. The site awards new miners with some hashing power on registration to start off their mining experiences. Thus, one can generate BTC, DOGE or LTC without putting in any of their own money. That definitely sounds good in theory, but does it really happen that way? The answer: NO. At a basic level, UltraHash.pw is a HYIP as it promises big returns on very little investment which does not make any sense from a business perspective. As we found out, you can only withdraw cryptocurrency from your UltraHash account if you had deposited some money or actually bought the hash power. Otherwise, you will find it very hard to withdraw the coins you mine from the free hash power you get when you register. But UltraHash.pw can’t tell you that, because they are a scam and don’t care about you, only what’s in your pocket, or bank account. How much of a scam is UltraHash.pw? Read through our comprehensive scam test below to find out. Our scam test is a series of questions designed to interrogate the critical aspects of any site under review and use the information therein to get to a conclusion. 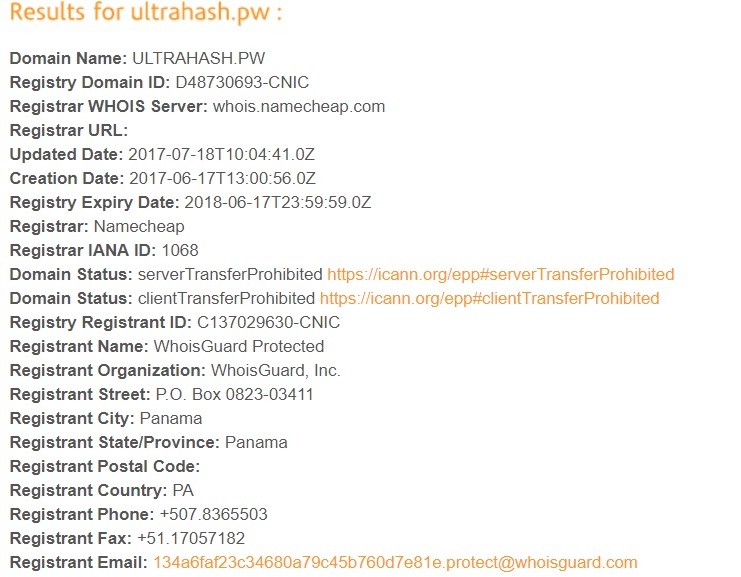 UltraHash.pw does not have an About Us section which is a bit unnerving and it leaves us unsure of who owns the site and the jurisdiction under which it is registered. For a company offering financial services, this is a big red flag. Does the site promise unbelievably large returns? While UltraHash.pw has all the qualities of a HYIP, it is fundamentally a cloud mining site and therefore cannot promise any regular returns. That said, the site does promise free hashing power to new miners and exponentially low rates which is a bit suspicious. Don’t they say that cheap is always expensive? Is the site registered privately or publicly? We looked up UltraHash.pw on Registry.pw and found out that the owners of the site had hidden their identities using WHOIS and it was basically next to impossible to track them. How long has the site been active? UltraHash.pw has only been active since early June 2017, which makes it about only a month old as at the time of writing this. Notably, online sites which have been online for more than half a year are more trustworthy than those that have only been active for a few months. What is the site’s ranking on Alexa? At the time of writing, UltraHash.pw has a ranking of 446,120 on Alexa.com, the world’s biggest tracker of online traffic. Alexa rankings are like a typical exam list – the best performers are ranked first while the rest take the other positions. As you can see, UltraHash.pw is not that popular which could be due to a lot of factors including low credibility and trustworthiness. Most of its visitors come from Brazil, Thailand, India, Pakistan and Indonesia. What does the online community say about the site? Also, if you opened your browser and searched for UltraHash.pw, you will find that most of the sites linking you to the official website are using affiliate links. There is no legit site linking to UltraHash.pw, which is not surprising since we don’t see anyone with a properly functioning brain accepting to work with such a site. Beyond all doubt, UltraHash.pw is a scam and we have proven it in the test above. Most importantly, the site has not been around for long enough to gain our trust and respect and frankly speaking, we don’t see it lasting too long either. It is our utmost hope that we have saved someone’s money by doing this review and we will not stop until we expose all the scams in the market. Verdit: Ultrahash is a SCAM! If you have been scammed by Ultrahash, please share your story with us by replying below. You may also contact us via email. To join our member list and receive additional scam warnings from us directly to your inbox, please subscribe to ScamBitcoin.com!